Is the watch any good in terms of quality? Is there real value to WatchGang at $29.99 a month plus shipping when other subscription services will occasionally send watches in their boxes as well (for much, much less money per month)? After all, does someone really need to own 12 new watches a year? Well, in an effort to answer all those questions, let’s take a look at this month’s WatchGang watch and share my thoughts! Recently, WatchGang released an update that allows you to add some more preference options to your profile so that they can better match the sort of watch that you’d like to receive. They let you now pick a metal color option — I chose gold as until now I owned exactly zero gold colored watches, but really wanted one. They also now let you set priorities for your preferences, which is super smart. As in, maybe you prefer a metal band over leather, but what you really care about is the watch face size not being too big. Well, now you can tell WatchGang that! As always, they don’t promise to ship you exactly what you want each month but, of course, they take it into account. As I have said, and will continue to say, this is still the point of WatchGang. They’ll be able to branch out and expand your watch collection, and tastes, but now they have a better sense of what you don’t like to make sure they avoid that. As usual, WatchGang sends out their watches on the 16th of the month, and they arrive just a few days later. No complaints in this department. As far as packaging goes, they put it in a plain ol’ box fitting the size of the watch box itself. Nothing glorious or over the top here. Super straightforward, and that’s all it needs to be. I don’t want to see them spending money on packaging here — put it all in the watch value. This is one of the few times you will ever see me say this, but it’s true. It is literally just the watch box inside as small a cardboard box as they can use — and that is exactly how it should be. Fellas, I was a little bit surprised by this watch, in a really good way. I opened it up and instantly liked what I saw — even more so than last month’s watch. If last month’s watch was a sure bet/playing it safe on WatchGang’s part in terms of what I would like, this month was pushing the envelope just a little bit, but they really nailed it. The watch is made by Auguste Jaccard, a company I had never heard of, know little to nothing about, and can find almost nothing about online (we’ll return to this point in a bit). The watch is a really nice gold color metal — not too flashy, but not muted either. The case is stainless steel (so no real gold, duh), both front and back. 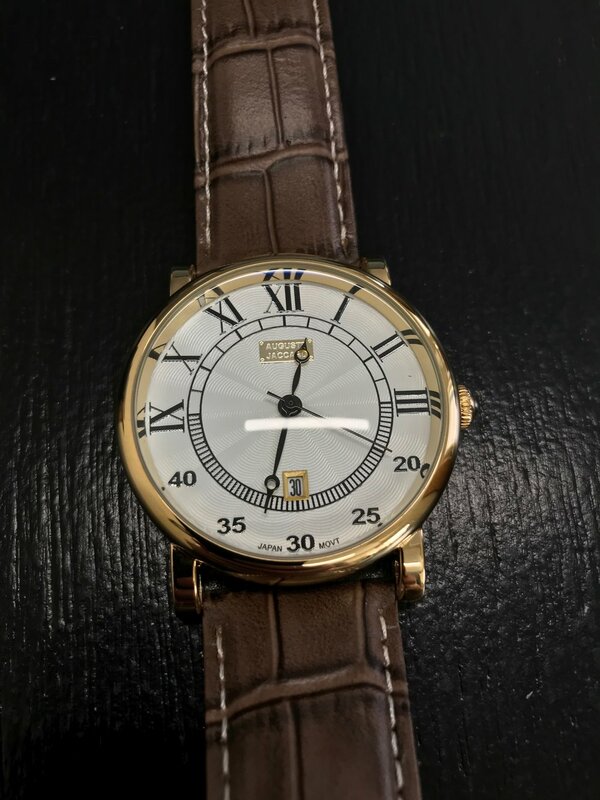 Let’s talk about the face: it’s a nice textured white background, with Roman numeral numbering for the top half of the watch, and minute amount numbers for the bottom half. This is a design I rarely see on watches, but I actually kind of like it. The inner ring of the watch similarly has only every few minute measures on the top half of the watch, and every minute measures on the bottom half. At the top of the watch there is an Auguste Jaccard plaque, and at the bottom of the watch there is a date window! Finally, the hour and minute hands have a really nice circle tip, and the second hand is a plain, thin straight hand line. Additionally, the crystal is slightly domed, and curves at the edges. While this looks nice — and actually got me a compliment the very first time I wore this watch — and is a cool and unexpected feature of this watch, it also distorts the time/face when looking from many angles. This could get annoying. This is not at all like the refined domes on, say, an Orient Bambino watch. It is there, but it’s not done super well. The watch is a nice thickness — which, if you prefer thinner watches, this is absolutely not, though I don’t mind a whole lot either way. Personal preference here. I think this watch is more on the thicker side of things, but it’s not crazy. The case diameter according to Amazon is 47 mm. This is just wrong. In my measurements, it hovers around 42 mm or so. This watch is definitely on the bigger side of things overall, which is not really to my liking. I don’t like big watches. I’m not sure this would qualify as “big” per se, but it’s certainly one of the largest overall watches that I own. Again, I still like it, but I generally avoid larger watches. This is especially strange because not only do I have large watches set to be my least favorite in the WatchGang preferences (as mentioned at the head of this post) , but I even put getting the size I want right as my number one priority in WatchGang’s setting. So, either they didn’t quite follow that this month, or they just don’t consider this watch to be that large. Like I said, it’s not so large that I won’t wear it. It’s just on the very border of what I consider to be an acceptable watch size. As to the strap, it’s a nice light-ish brown crocodile-style leather with black burnishing and white stitching. This is far from my favorite watch strap I own, but it’s not bad per se, and goes nicely with the gold (even if I do prefer black watch straps on gold watches). Indeed, watch straps are very easily swapped out, and this one that it comes with is definitely nice enough to wear. It looks fine. On that note, the lugs of this watch are a more unusual 24 mm apart, so that makes switching out the straps a bit harder, as not a single other one of my watches has so wide a lug distance. Overall, this is not the sort of watch that I would choose to buy, but I am very, very happy to own it. And that is exactly the point. It’s a design that I like, but wouldn’t know that I like necessarily. It’s a bit unique, stands out in a subtle sort of way — if that makes sense — and has a lot to it without being busy. It’s a nice looking watch that, while it won’t be my go-to, will definitely see some serious play in my rotation. I am very happy to have this in my collection (as will also be discussed more below). The watch has an impressive weight to it — it’s much heavier than last month’s watch, and in a good way, considering how lightweight last month’s watch felt. This feels substantial. The leather is… okay? I guess? It’s claimed to be genuine leather, and I believe that. It’s not amazing by any means, and is very stiff when it first comes out of the box. It looses up a nice amount, but it has a sort of cheap look to it that won’t go away with time, obviously. If anything, the opposite would be true. Again, it’s not a terrible band by any means, it’s something of unique look, and I have felt far worse leather straps on watches before. But this is also nothing to write home about. The watch is water resistant to 30 meters which is quite a bit less than 50, which is what I would like to see, but, as a dress watch, this is more understandable. The dome is a mineral crystal and the watch uses a PC21 Japanese Quartz Movement. The value for this watch has to be considered at two levels. Number one is the value for the $40 that a month of WatchGang Original tier costs. At that price, this, I think, is a great deal. I was super excited when I opened it, and have enjoyed wearing it once or twice since then. Again, this is not going to be a go-to watch for me, but I am stoked to have it in my collection. I really must say, WatchGang did a great job here. For $40, I think this watch was worth it. Number two, though, is it’s general value just as a watch at retail price. Amazon has this watch listed at $150! Other than that, this is hard to find anywhere online. At that price, this watch is a ripoff. For that kind of money you can get an automatic Orient watch with a much nicer strap and a real company name behind it. Now, this company seems like the sort of company that overprices their watches and then perpetually has them on sale, but I cannot seem to find this watch at any better price (nor really any information on it, or the brand at all). This may well be a $150 watch by retail, but it’s not at all worth that. Which, of course, leads to answering the final question with which we began this article. Is WatchGang as a subscription service worth it? Well, they did a good job picking this watch, yes. And the watch is of decent enough quality for $40. However, while they tout the fact that you can get a watch that’s 3x the value of what you paid — and that’s essentially what I got — this is a bit disingenuous as this watch is not worth 3x what I paid. It’s worth what I paid. But this is the issue with all of these subscription services, where technically the value of the box is way higher than what you paid, but that is going by inflated retail prices. Still, usually, you do come out more than just a little bit ahead — it’s just not quite as big a savings as what they portray. With WatchGang, though, you only get the single watch. Either you get something worth a little bit more than what you paid, and you feel like you got a deal, or you get something that’s worth just about what you paid — even when the technical retail price is higher — and then you basically just paid for WatchGang to pick a watch for you. This latter reality is not necessarily a bad thing, but it is something to be aware of. Further, at what point does this subscription become a bit too much? Do you really need 12 new semi-cheap watches a year, picked out by someone else? Maybe, maybe not… Considering you can get a semi-cheap watch or two from other subscription boxes, I’m not sure of the real value of WatchGang here. However, that’s just the Original tier. What about the level up, the Black tier, for $100 that promises much higher quality watches than the Original tier, sometimes up to $500? Would it pay to subscribe to that tier for even just a few months to add some really decent watches to your collection? Might this be the real value and true audience for WatchGang? (And the lower tier is just to able to cater to more people?) Well, it is this that we will try to discover next month when I get our first WatchGang Black tier subscription box. It should be very telling about what this service truly is, and who it is truly for.